Looking For A Movie Star Smile? The Secret is Porcelain Veneers! Tom Cruise, Hilary Duff, Zac Efron, Ben Affleck, Miley Cyrus, and Nicholas Cage are just a few of the Hollywood names that come to mind when you think of beautiful smiles. Did you know that these stars didn’t always have the dazzling grins you know them for today? It’s true! In fact, most have relied on cosmetic dentistry, and more specifically porcelain veneers for their dazzling teeth. Would you like to know how porcelain veneers can enhance your pearly whites? Because a veneer fits over your tooth and is directly bonded to it, you can completely redesign your smile. This is because veneers can change the shade, shape, or size of your teeth. If you’re interested in learning more about how porcelain veneers can improve your smile, the first step is to consult with your dentist and create a plan for your new smile. Veneers can typically be completed in two appointments after your consultation. At your first appointment, your dentist will prepare your teeth for your veneers. You’ll be sent home wearing temporary veneers that will be very similar to your final restorations. This is a great time to get used to how they look and feel and let you dentist know of any adjustments you’d like. After your final veneers are done being hand crafted at a dental laboratory, you’ll return to have your dentist permanently place them. Now you are ready to share your new smile with the world! If porcelain veneers are not the right option for you, there are other cosmetic procedures that can help you achieve your goals. 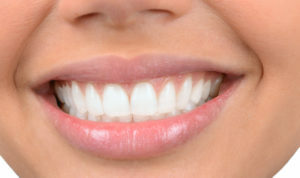 Veneers may also be used in combination with other treatments for a complete smile makeover. Don’t live with a compromised smile any longer! Contact your dentist today to learn more about your options. For nearly 25 years Dr. Mark M. Makram has been taking care of smiles in Naples, FL. Dr. Makram has spent thousands of hours in continuing education with focuses in the fields of cosmetic and implant dentistry. You can rest assured that Dr. Makram is highly skilled and well equipped to provide the smile you’ve always dreamed of. If you would like to reach Dr. Makram, you can contact us through our website, or by calling 239-513-9990. Comments Off on Looking For A Movie Star Smile? The Secret is Porcelain Veneers!